Ronald Greeley, a Regents' Professor of Planetary Geology at Arizona State University who was involved in lunar and planetary studies since 1967 and who contributed significantly to our understanding of planetary bodies within our solar system, died Oct. 27, in Tempe. He was 72. As the son of a military serviceman, Greeley moved around a great deal as child. As a result he saw many different geological landforms and it was no surprise that when he went to college, he majored in geology. Greeley earned undergraduate and graduate degrees from Mississippi State University. After receiving his doctorate in 1966 at the University of Missouri in Rolla he worked for Standard Oil Company of California as a paleontologist. Through military duty, he was assigned to NASA's Ames Research Center in 1967 where he worked in a civilian capacity in preparation for the Apollo missions to the Moon. 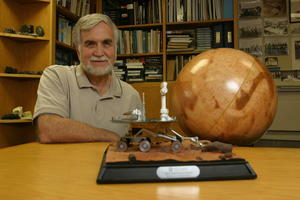 He stayed on at NASA to conduct research in planetary geology. "I had been on sabbatical at NASA Ames Research Center working on the analysis of lunar samples, and I saw Ron and I saw potential," recalls Carleton Moore, founding director of ASU’s Center for Meteorite Studies. "When I got the opportunity, I hired him." Greeley began teaching at ASU in 1977 with a joint professorship in the department of geology and the Center for Meteorite Studies. He studied wind processes on Earth and other planets and conducted photogeological mapping of planets and satellites among other research projects. In 1986, Greeley left the Center for Meteorite Studies to serve as chair of the department of geology. "Ron Greeley was indisputably one of the founders of planetary science, and the influence he has had, both through his own work and through the students and colleagues that he guided and mentored, touches virtually all aspects of this field," says Christensen, a Regents' Professor in the School of Earth and Space Exploration in ASU’s College of Liberal Arts and Sciences. "Ron played a major role in my career," says Christensen. "I came to ASU specifically to work with Ron after receiving my graduate degree, and I have remained at ASU for 30 years largely because of the remarkable environment that Ron created here to foster planetary science as an extension of geology." Greeley, a pioneer in the planetary geology field, served as the director of the NASA-ASU Regional Planetary Image Facility and principal investigator of the Planetary Aeolian Laboratory at NASA-Ames Research Center. He served on and chaired many NASA and National Academy of Science panels and he was involved in nearly every major space probe mission flown in the solar system since the Apollo Moon landings. Mission projects included the Galileo mission to Jupiter, the Magellan mission to Venus, and the Shuttle Imaging Radar orbiter around Earth. He was also part of the data analysis program for the Voyager 2 mission to Uranus and Neptune. His projects focused on the moons of these distant bodies. Passionate also about Mars exploration, he was involved with several missions to the Red Planet, including Mariners 6, 7, and 9, Viking, Mars Pathfinder, Mars Global Surveyor, and the Mars Exploration Rovers. He was a co-investigator for the camera system onboard the European Mars Express mission. Former students scattered throughout the universities and research institutes of this country provide testimony to his influence on planetary geology. "As I began my research career, Ron reminded me of the old adage: 'A journey of 1,000 miles begins with a single step.' I am fortunate to have had Ron there walking beside me," says Robert Pappalardo, senior research scientist at NASA's Jet Propulsion Laboratory. Greeley served as Pappalardo's advisor. After receiving his doctorate from ASU in 1994, Pappalardo worked with Greeley for a year as a postdoc. Since about 2002, the two worked together on defining the science basis for Europa mission studies. "Ron was a gentleman, a statesman, a mentor, a scholar," says Pappalardo. "Not a day goes by that I don't think, in some situation, 'What would Ron Greeley do?'" "Ron was a profoundly influential scientist whose imprint on planetary science will live on through his body of research and the many students he taught and mentored. He was a wonderful friend and colleague. We were fortunate to have known him and will miss him terribly," says Kip Hodges, founding director of the School of Earth and Space Exploration. Greeley served a year as interim director of the school before Hodges joined ASU. "Ron was a very good friend of mine for many years, an incredible leader in planetary science, and the founder and guiding force for planetary science here at ASU. His leadership, friendship, and vision will be sorely missed," says Christensen. Greeley's work lives on in proposed missions to Europa (a moon of Jupiter), and in the numerous students he mentored who today play pivotal roles in space science exploration efforts. Greeley is preceded in death by his daughter, Vanessa. He is survived by his wife Cindy and his son, Randall (Lidiette). He leaves behind three grandchildren. Ronald Greeley, a Regents’ Professor of planetary geology at Arizona State University who has been involved in lunar and planetary studies since 1967 and has contributed significantly to our understanding of planetary bodies within our solar system, died Oct. 27, in Tempe.